"Mark Channing" was the pseudonym of Leopold Aloysius Matthew Jones, the first of four children of George Horatio Jones (1844-1920), a dental surgeon, and his wife, Blanche Louisa Lucas (1843-1908). He had two younger brothers and one sister. Little is known of his early life and education. His father published, as George H. Jones, a book Dentistry: Its Use and Abuse (1872), and sought a patent in 1875 on a method of adapting artificial teeth by use of atmospheric pressure. A further book was on Painless and Perfect Dentistry (1885). Leopold was a medical student at Guy's Hospital Medical School before he served in the Boer War, returning to England in 1902, after which he joined the Indian Army and started out at Fort St. George in Madras, though he was later stationed in Ceylon, Bangalore, and other places. Since boyhood he had aspired to be a poet, and in Madras he published a slim book Poems (1904), bylined Leopold Jones, with a larger follow-up of the same title the following year. He spent close to twenty years as an officer in the Indian army, retiring in October 1921. In the summer of 1910 he married Anna ("Nan") Maria Levy, with whom he had two daughters and one son. After retiring from the army with the rank of Major, he worked for the British Hungarian Bank. 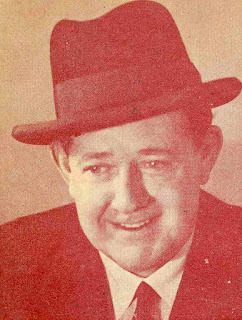 From 1924-26, he served as editor of the Economic Supplements of Le Temps in Paris, and from 1929-31 held a similar position at The Morning Post in London. He began publishing short fiction and character sketches, first as "Major L.A.M. Jones." 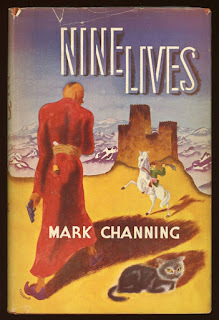 By the early 1930s he was using the byline "Mark Channing." His first novel was serialized in The Daily Mail from May 4 through June 21, 1933. 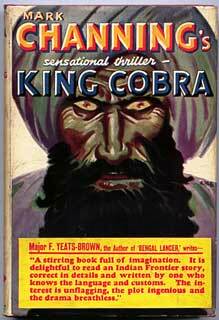 King Cobra (London: Hutchinson, [June] 1933; Philadelphia: J.B. Lippincott, [June 1934]) was the first of four novels Captain Colin Gray, of the English Secret Service in India. 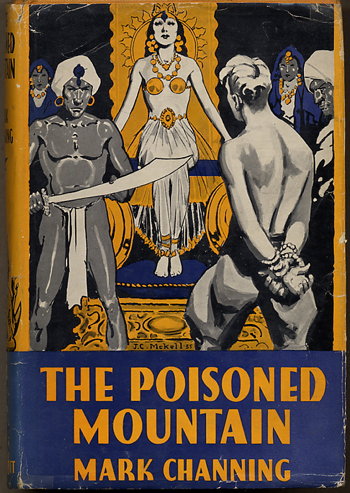 The Colin Gray thrillers were similar to the novels of Talbot Mundy, and their mix of adventure and Indian mysticism was popular with readers, particularly in the United States. The follow-up novels were White Python (London: Hutchinson, [April] 1934; Philadelphia: J.B. Lippincott,[October 1934]), The Poisoned Mountain (London: Hutchinson, [July 1935]; Philadelphia: J.B. Lippincott, [November 1935]), and Nine Lives (London: Hutchinson, [August 1937]; Philadelphia: J.B. Lippincott, [September 1937]). Channing also published a nonfiction volume, Indian Mosaic (1936), which was retitled India Mosaic for its U.S. release (also in 1936), and one non-fantastic novel, Indian Village (1939), retitled The Sacred Falls: A Novel of India for its U.S. edition published three months later. 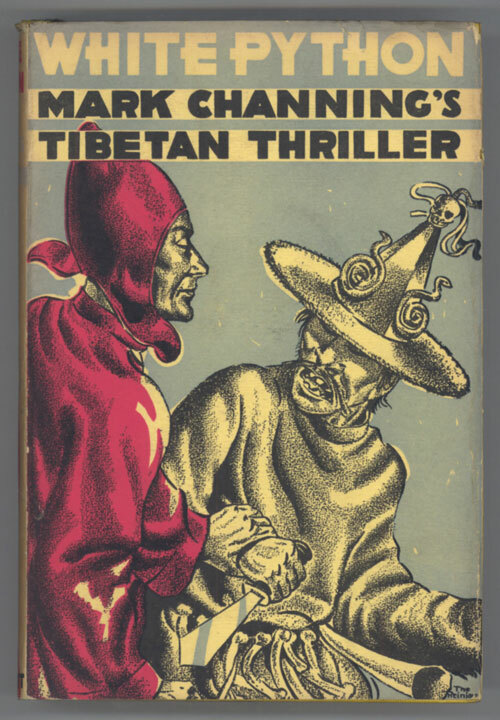 At the time of his death at the age of 64, Channing was working on what was described to be his finest work, The White Bird, a book seeking to show a common foundation for all religions. A collection of thirty-four short stories, The Breath of Genius (London: Hutchinson, [October 1944]), appeared posthumously, and only in England. It contains a short memoir of Channing by Sir John Pollock, who notes that Jones was familiarly called "Lamb" (from his initials, L.A.M.) and that he used a pseudonym when he turned to fiction because he was told that "Jones" was impossible for an author. Pollock notes: "he was tall and massive, and held himself well; and on this big body was set a big, handsome head, with expressive features, and very fine, often laughing, dark blue eyes. Habitually he dangled a gold-rimmed monocle slung on a broad silk ribbon which he used in his right eye for reading; and this, coupled with a certain easy, courteous manner that he had in all things, gave him somewhat the look of those grand Irish gentlemen of a century and over ago, from whom indeed he was doubtless descended." The dustjackets themselves would force you to buy these. The UK dust-wrappers aren't bad either, but I've only seen three of them, so I went with posting the Lippincott ones.